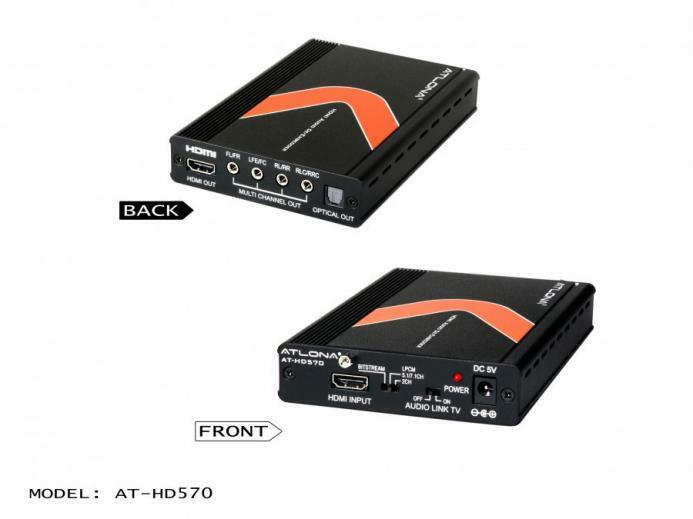 The Atlona AT-HD570 is a professional quality HDMI Audio De-Embedder. Unit is capable of accepting an HDMI input signal and de-embedding the audio signal to either Optical or Multi-Channel analog audio outputs. This audio decoder supports uncompressed analog LPCM 7.1, 5.1, 2ch through the mulit-channel analog outputs with Dolby Digital, LPCM 2CH and DTS output through optical connection. Supports Dolby True HD and DTS HD Master Audio pass through HDMI connection. Supports Dolby Digital, DTS 5.1, 2ch, and LPCM 2ch output through optical connection. Integrated HDMI Booster and Repeater.